BlogHome » Blog » So, graduation! A Translator? And then, What: Closing the Curtains! So, graduation! A Translator? And then, What: Closing the Curtains! I was meant to write this mini blog post way before the Christmas and New Year celebrations, so that I can actually offer its content as a present to 20 upstanding colleagues and friends, but when I make plans, someone in the sky looks at me, points a finger and mockingly laughs at me! I have been quite busy during the holidays as well, since Wordyrama is always open, so no time to finish it! Keeping it short, I am honored to present to you the very first edition of: THE BLOGORAMA, Wordyrama’s finest! Volume 1! 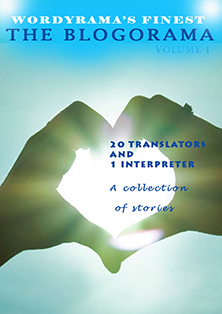 And, of course, there would be nothing more valued and a greater honor than featuring a collection of stories written by the wonderful language professionals! To the Authors: Please feel free to downloaded, link it on your site, do whatever it is you want to do with it! It was your creation, after all! So, graduation! A Translator? And then what? Anna’s story! Thanks a lot, Konstantina, for compiling the stories! Thank you, once again, for inviting me to participate in this wonderful idea! I feel honoured to be among these great professionals! I hope you have an excellent year full of fulfilling projects! You are very welcome! Such stories need to be acknowledged! Say “hi” to Luciana from me! Have a buzy, busy year! I was really pleased, when my story was published. Thank you for the opportunity, Konstantina. It is great to hear from you! It is always a great pleasure for me to share such interesting stories with colleagues and clients alike! And your story is unique! Thanks again Donald! I felt honoured to be invited to present my ‘setting-out’ story. It was also an utter delight to meet you recently – even if ever so briefly – in Athens at the IAPTI conference. If only we could’ve spent more time chatting! Best wishes to you, along with my esteemed colleagues, for your end-of-year activities – full of prospect, I hope! Can’t believe we’re already in October! It was great meeting you, too! Yes, it is a shame we didn’t get the chance to chat a little more, but I am sure we are going to meet again soon! Best wishes and please keep in touch!